You’re pretty RAD-ish! Day#2 Sneak Peek of Taylored Expressions June Release! Hey everyone, Hope you enjoyed my projects from Day #1 sneak peek. 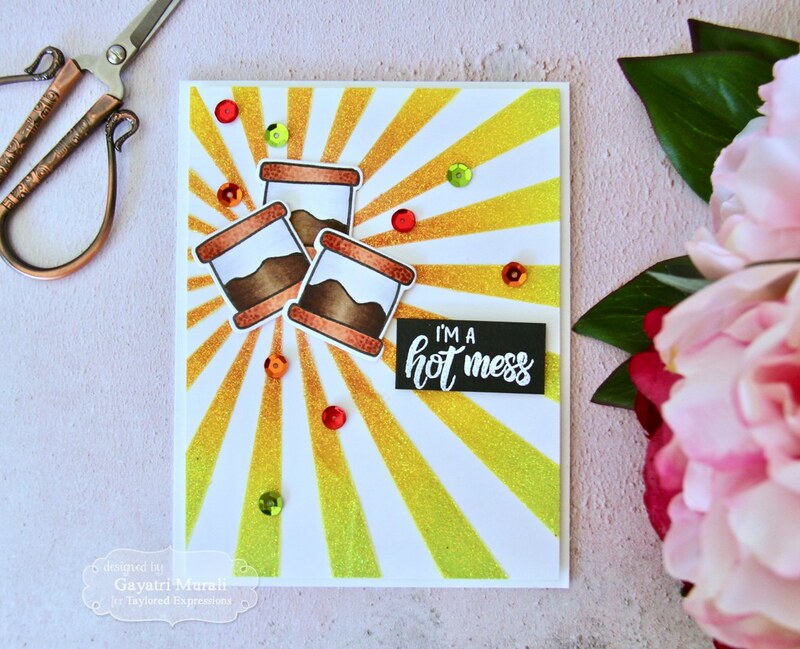 Today is day #2 sneak peek from Taylored Expressions June Release. I have two projects to share today as well. So lets jump into it. Here is my first card. 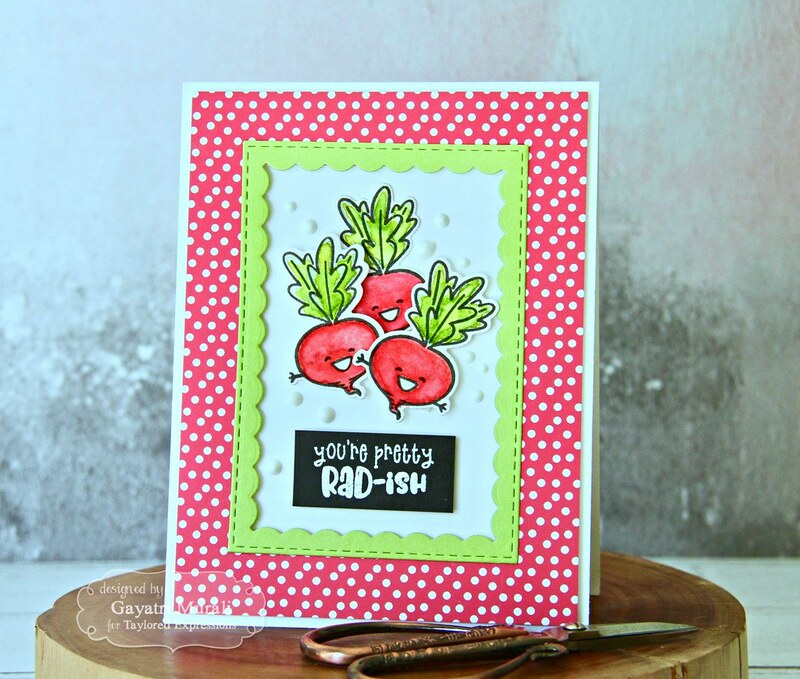 This card showcases the new Turnip the Beet stamp set and coordinating die. 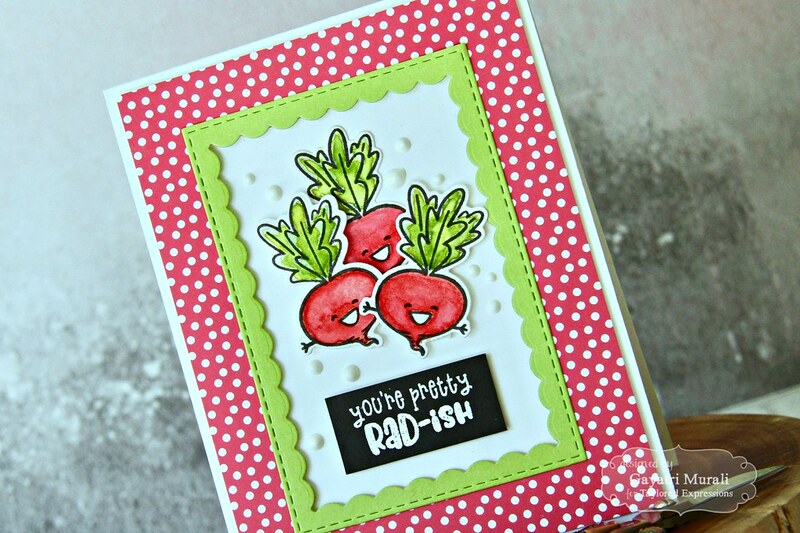 I should say, I love the punny sentiments in the stamp set and the cut veggie images. 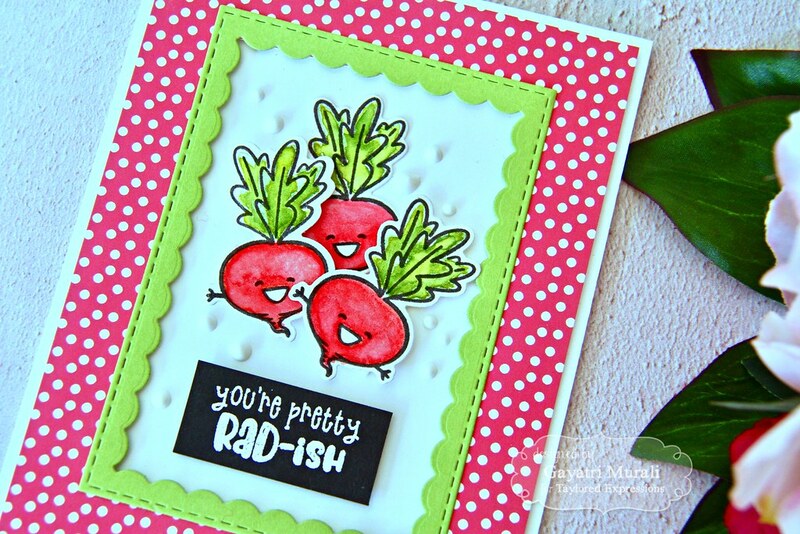 I stamped the radish image from the stamp set three times using Oreo ink on watercolor paper and coloued them using the new TE Liquid Watercolor. The colours I have used are Guava, Lemon Meringue and Peapod. These liquid watercolors are gorgeous, highly pigmented and fantastic to work with. Once dry, I die cut them using the coordinating die. Then I arranged and glued them into a cluster. The card base is SugarCube cardstock. 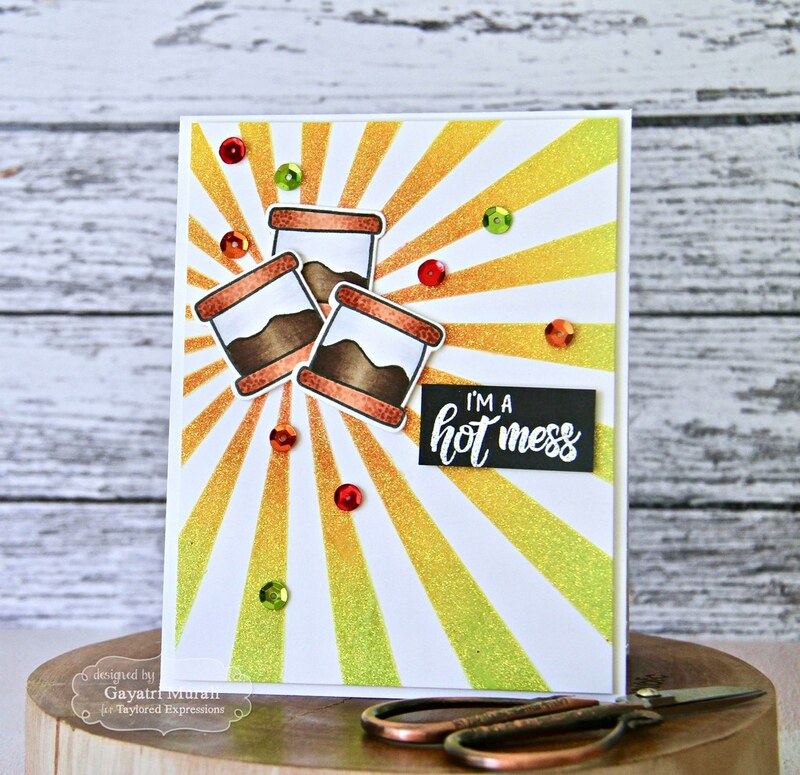 I used dies from Stitched Rectangle Stacklets and Inside Scallop Rectangle Stacklets to create a inside scallop stitched rectangle frame using Granny Smith cardstock. 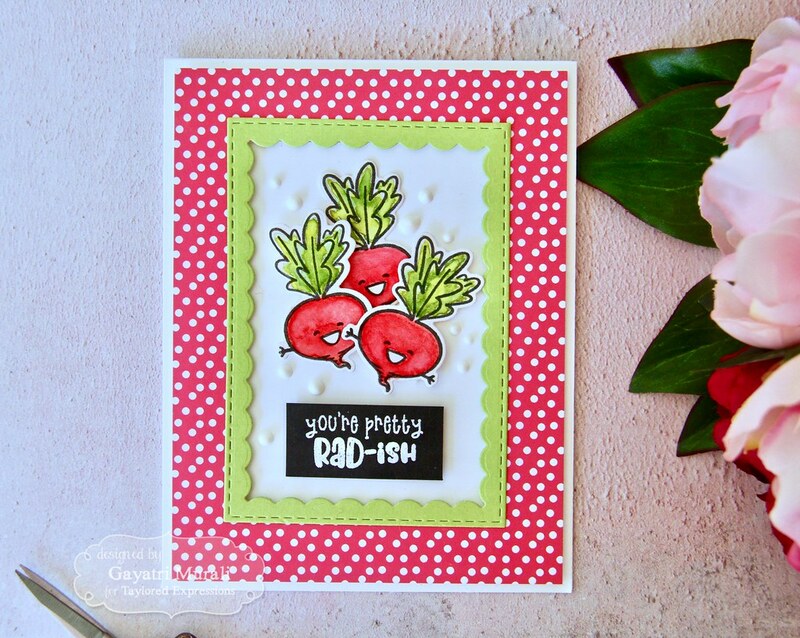 The layering panel is pattern paper from the new Hello Sunshine pattern paper pack. I used the same stitched rectangle die to create a window on the pattern paper trimmed to 4″x5.25″. Then I adhered the inside scallop stitched rectangle green frame on the window The entire panel is adhered on the card front using foam adhesives for dimension. On the inside of the scallop window, I adhered the radish cluster again using foam adhesives. The sentiment is white heat embossed using TE detailed white embossing powder on a piece of Oreo cardstock. I adhered this piece below the radish cluster. To mimic the white dots on the pattern paper,I used white nuvo drops inside the window. 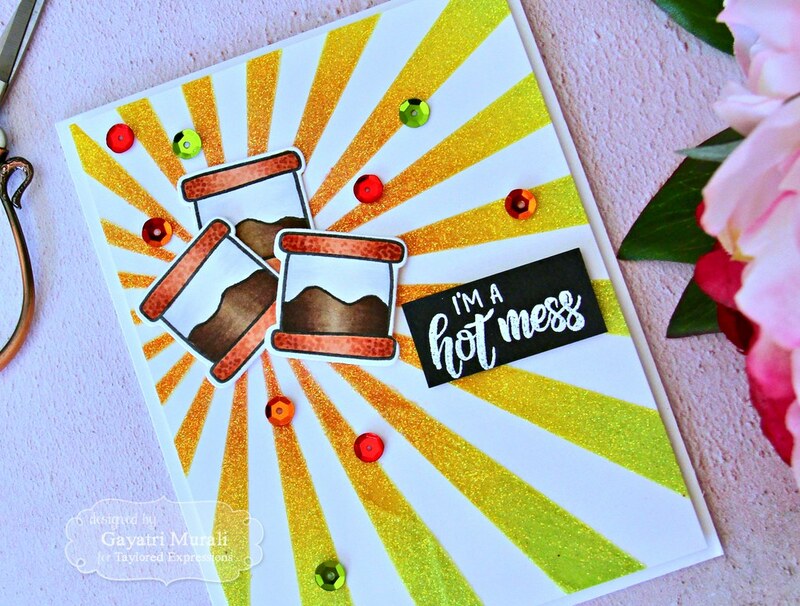 For the second card, I used the new Ooeey Gooey stamp and die combo along with the new Here Comes the Sun stencil. I stamped three of the S’more images from the stamp set. I added another layer on them using copic friendly black ink. Then I coloured the images using copic markers and die cut them using the die from the stamp set. I also white heat embossed the sentiment from the stamp set using TE white detailed embossing powder on a piece of black cardstock. For the background, I used Here Comes The Sun stencil. I sponged TE Guava, Candy Corn, Lemon Meringue and Lime Zest TE dye inks. Then also added the Nuvo Moonstone glimmer paste on top of the sponged area. This paste is clear shimmer. So the colours show through with the gorgeous sparkly texture. Love how the background turned out. I arranged the S’more in a cluster and glued one down and the other two using foam adhesives. The sentiment strip besides the cluster slightly below. Finally I added some metallic sequins from Rainbow Brights sequins. I adhered this panel on a Sugar Cube cardbase using foam adhesives. There is a promotion at Taylored Expressions Blog. For a limited time, earn DOUBLE CRAFTY POINTS when you purchase our NEW TE Liquid Watercolor Collection! Included in this exclusive bundle are all 12 bright liquid watercolor hues, our innovative, unique shimmer liquid PLUS a bonus set of 4 mixing palettes to explore your creativity! If you’re not a Crafty Points member, it’s free and easy to join. 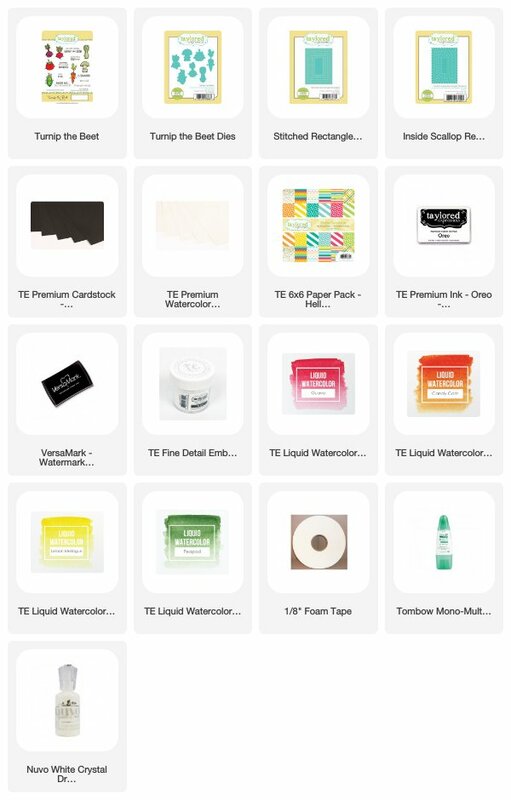 Just create an account at the TE webstore and you’re automatically enrolled to begin earning crafty points with every purchase. 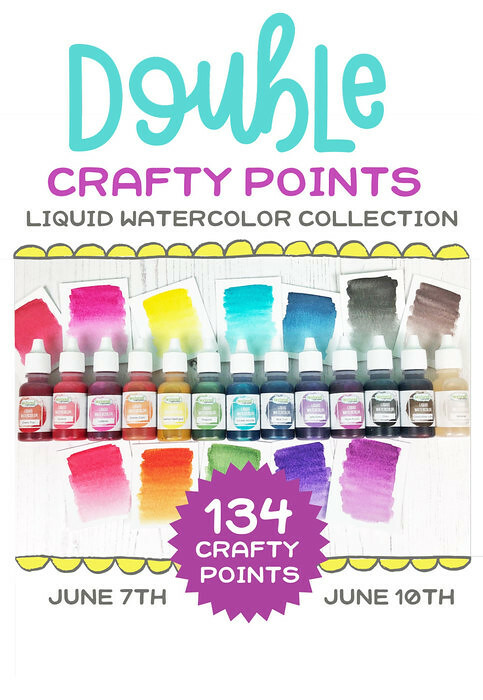 You’ll earn 134 Crafty Points on the purchase of our TE Liquid Watercolor Collection! Offer valid on qualifying purchases made between 9am CDT on Thursday, June 7, 2018 and 11:59 pm CDT on Sunday, June 10, 2018 and only while supplies last. Crafty Points are only available on purchases made via our retail site: www.tayloredexpressions.com. 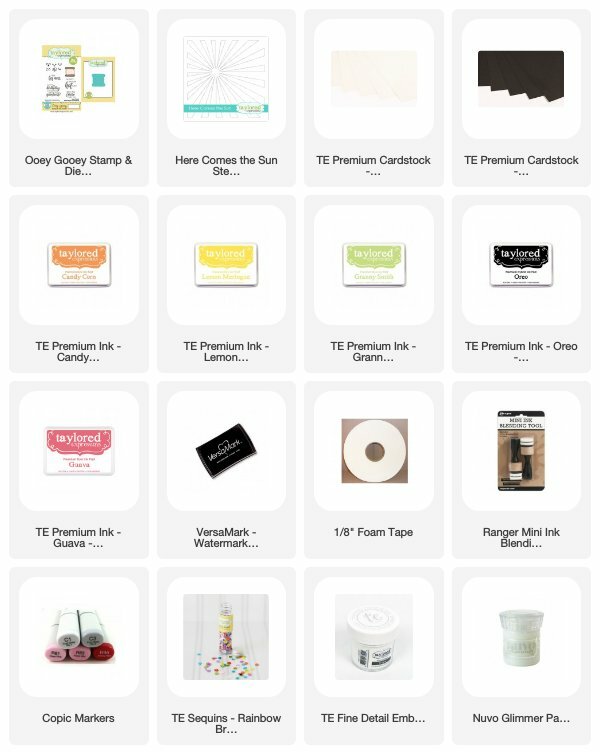 Check out Taylored Expressons Blog for more details on the giveaway as well as inspirations from the rest of the TE designers. Make sure you leave some love to all of them. I will see see back tomorrow with day #3 sneak peek projects. 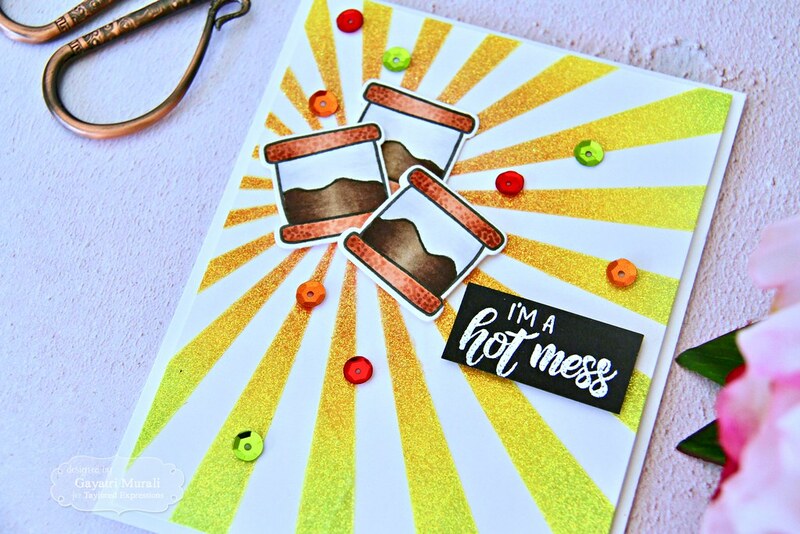 These are so super cute and fun! More beautiful cards. 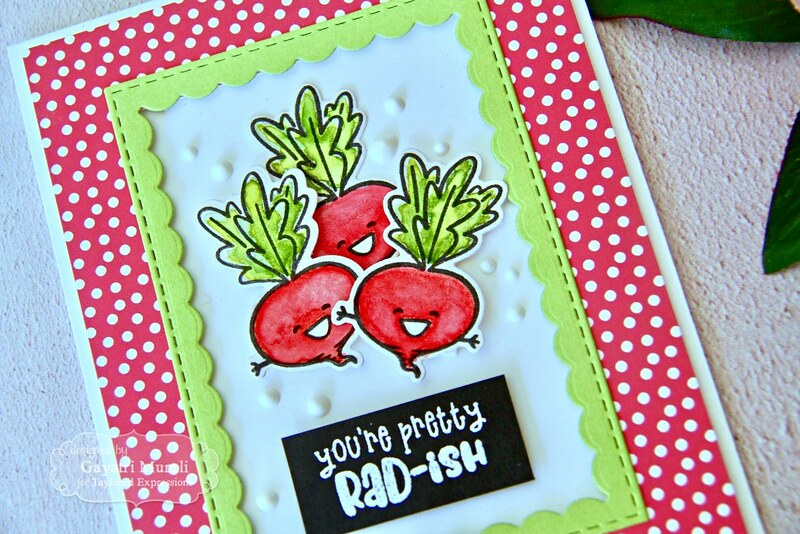 Love the radishes… cute set! Love the sun rays behind the s’mores. Awesome cards! 🙂 Really love the radish one.